Restricts MP Joint. Low profile, comfortable thumb spica. Universal left and right. The Thumb Spica is a low-profile brace designed to immobilize the thumb while still allowing full use of the other fingers. It is constructed from BioSkin's hypoallergenic, breathable, and soft material so it can be comfortably worn for hours at a time. A rigid, yet customizable, aluminum stay runs along the thumb to provide support and immobilization. The brace then wraps around the wrist, providing compression to reduce pain and enhance recovery. It can be worn on either your left or right hand and comes in two different sizes. 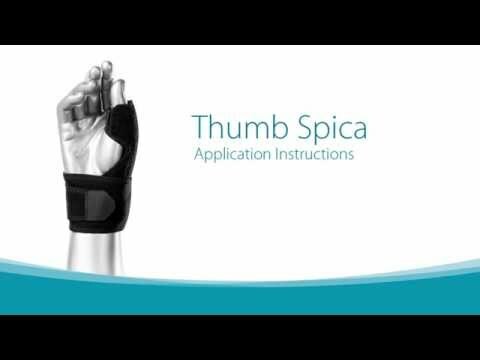 Ease the pain from thumb injuries with the Thumb Spica. Its slim and comfortable design allows for full use of your fingers while supporting and immobilizing your sore thumb. Recover from arthritis, bursitis, De Quervain's, Gamekeeper's Thumb, and sprains and strains. The brace wraps around the base of your hand for extra compression on your wrist, relieving pain and enhancing recovery.